Polydron is the original and best geometric construction product, renowned worldwide for its quality and versatility. It is specifically designed and developed to meet the demanding requirements of the modern classroom, helping teachers and children alike in the quest for knowledge and understanding. 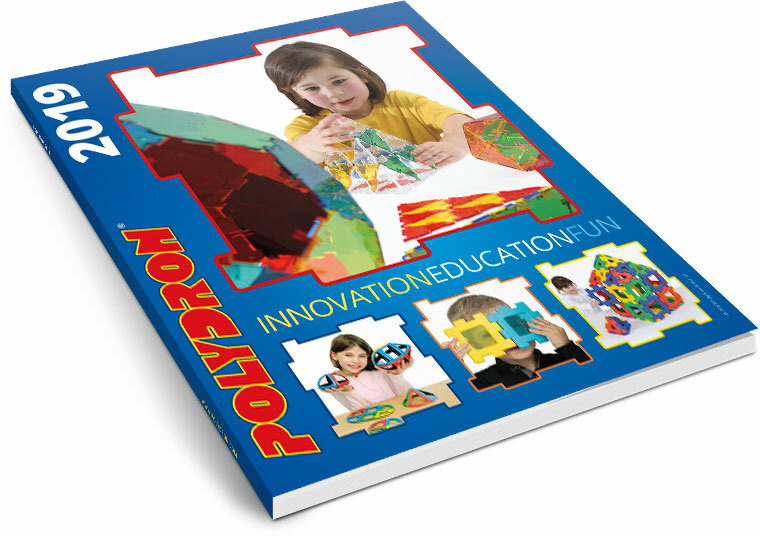 Although Polydron is the worlds' leading product in its field and has become a trusted quality teaching tool for teachers and pupils, there is so much more to this excellent invention that has become part of the fabric in many schools and homes around the globe. Children from as young as four and right up to the level of university graduation have benefited from its versatility. Made from durable ABS, it lends itself to the thirst for creativity and the development of manipulative skills for younger users. From the most basic early shapes of cubes and prisms, and progressing right up to the full set of Archimedean solids, the world of Polydron shapes leaves no stone unturned in its quest to help children to understand and enjoy geometry. The product has been developed over many years, and is now recognised as a very useful addition in many wider areas of the classroom. The teaching of time and design & technology are areas that have benefited from Polydron's new direction. Polydron is divided into five product groups: Original Polydron, Magnetic Polydron, Giant Polydron, XL Polydron and Junior Polydron. The original and still superior construction shape, recognised in many countries as the world's leading resource for teaching Maths; two and three-dimensional geometry; design and technology. It is used as a major aid for developing spatial awareness and is easily used by children, giving excellent play value, although it is versatile enough to be utilised for complex mathematical theories. The unique joints readily snap together giving a superior hinge. This design is critical to forming two and three dimensional geometric shapes. A fantastic innovation that allows children to explore the worlds of shape and space and magnetism all in one exercise. Magnetic Polydron combines the fun of construction with the lessons of polarity. The ultimate magnetic construction set for 3+ year olds manufactured from hard wearing exceptionally high quality plastic. Mega Mag encourages students to explore geometry and identify the properties of 2-D and 3-D shapes. Students will enjoy constructing unlimited designs whilst gaining a knowledge and awareness of mathematical concepts, geometry and the basic principles of magnetism. It will also encourage creativity and teamwork amongst its users with its easy to handle and versatile nature. These chunky, brightly coloured squares and triangles quickly and easily fit together to make a wide range of shapes and models whilst encouraging the development of problem-solving; strategies; perseverance, and logical thinking. Due to their polarity, magnets are self-correcting, and the coloured side (orange, yellow, green, purple or blue) pieces join together, but not with the reverse white side. Squares measure 12cm x 12cm. Creative play for little hands. By joining together simple structures and patterns, children will become absorbed very easily into the endless possibilities and will work together whilst having fun. The eight-sided pieces and struts slot together easily and with the addition of the wheels set, moving models are simple. This brilliant and colourful large construction invention from Polydron will challenge the creative minds of the children in your care. The textured surfaces of 'GO' make the shapes very tactile and connection is simple and easy to do. Giant Octoplay can be transformed into colourful shapes such as faces, flowers or even a dog. It will bring fun animal shapes into the learning space or can be used to simply make a chain. The product is suitable for use outdoors or inside - it is extremely durable but also light. Each piece measures 24cm across enabling children to easily construct really large models. These construction sets help children to understand spatial awareness from an early age, whilst having great fun. The product encourages children to make and recognise 2 and 3 dimensional shapes such as a rocket, star or a boat. The shapes are designed so they are easy for little hands to manipulate. The product is heavily textured on one side to help users recognise different shapes and forms and also marked with Braille to help children be aware of alternative forms of communication. A must for all early years and special needs environments. Four times the size of Giant Polydron! Giant Polydron & XL Polydron Designed to fit together perfectly! Imagine being able to build castles, a princess's tower, cars, boats, and houses with tunnels to crawl through! Children will be able to build large constructions, whilst all the time learning about shape, 2 and 3 dimensional objects, texture, teamwork and role play. They will work together to put their ideas into reality. The brand new product from Polydron. Junior Polydron fits together easily and stays together. It is made from super durable plastic and designed to allow the easy construction of thousands of exciting models such as cars, planes and other fun models. Junior Polydron can be easily used by children of 3+ years. Using only the two most basic shapes as its foundation, the triangle and square, Junior Polydron is amazingly versatile and allows for the construction of simple or complex models. The fantastic soft touch wheels and multicultural characters easily fit with these shapes to add versatility and play value to this exciting new product.